Breaking trail to the high point in the upper basin. 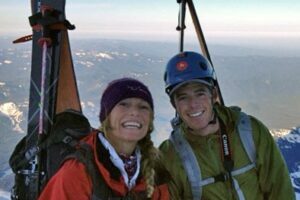 Castle Peak’s 14,000 foot summit is up above. Fall just wouldn’t be complete without a trip up to Montezuma Basin. 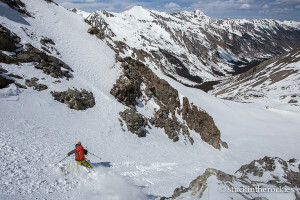 A friend had told me that the recent wet weather was falling as snow up in the basin at 13,000 feet, and that the skiing was actually pretty good. Better yet, the road was still mostly dry and you could drive high up the road. 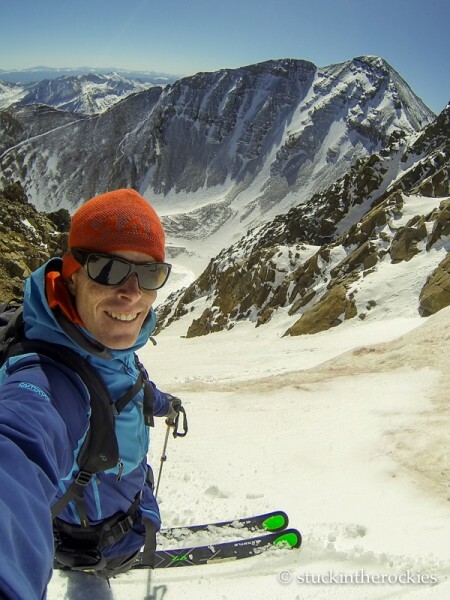 So Joey and I headed up there this past weekend with our rock skis to see what it was like. We thought it was worth the trip. 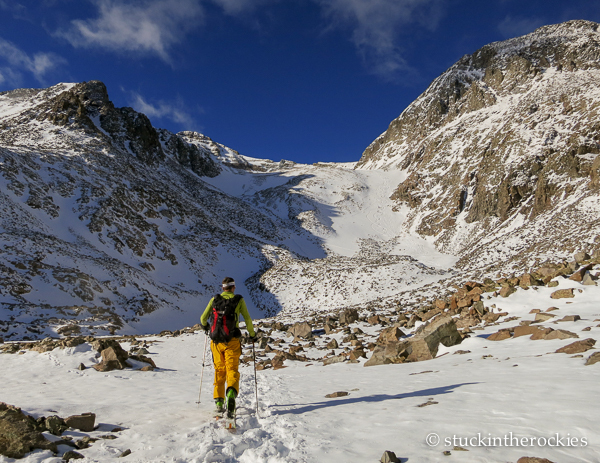 The snow in the upper basin would best be described as “highly variable”, but the lower slope was actually soft, and a trip up and down the Conundrum Couloir was super-fun. 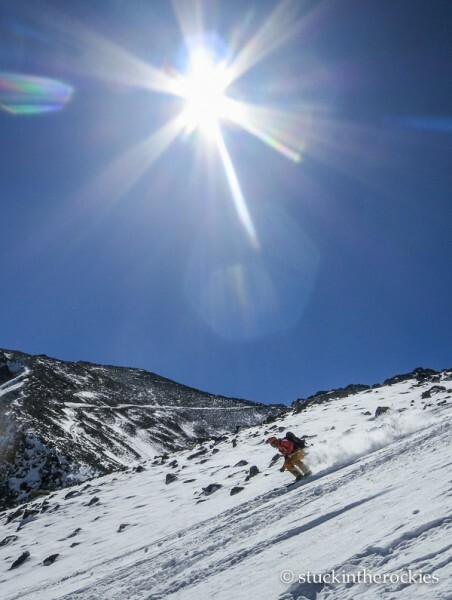 Overall the coverage was pretty thin, it might be best to wait for more weather to fill things in some more, but if you’re really eager to put on the skis, you might find it’s worth the trip. At the end of the road, with the lower slope in sight. 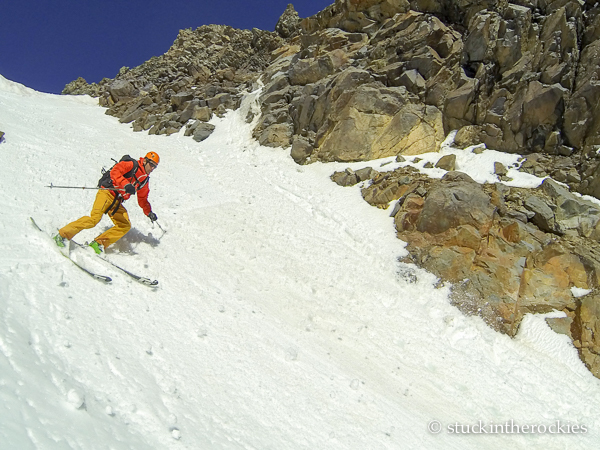 Following Joey’s lead (as usual) up the Conundrum Couloir. Having lunch at the 14K saddle between the two summits of Conundrum Peak. 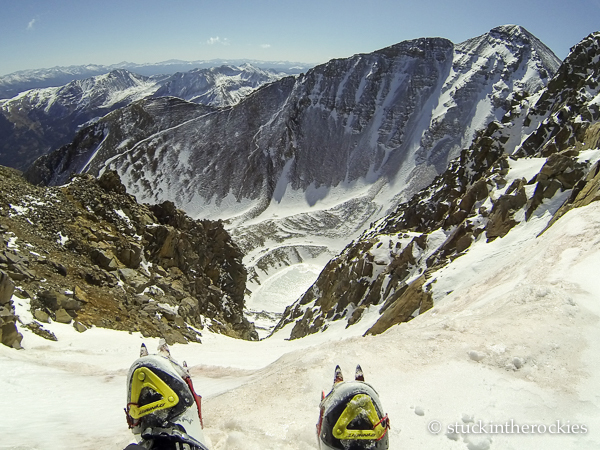 Castle Peak can be seen out there, and the North Couloir is looking like it needs more snow. Not surprising for October 5th. It’s always so fun to get up here this time of year. We’re skiing! 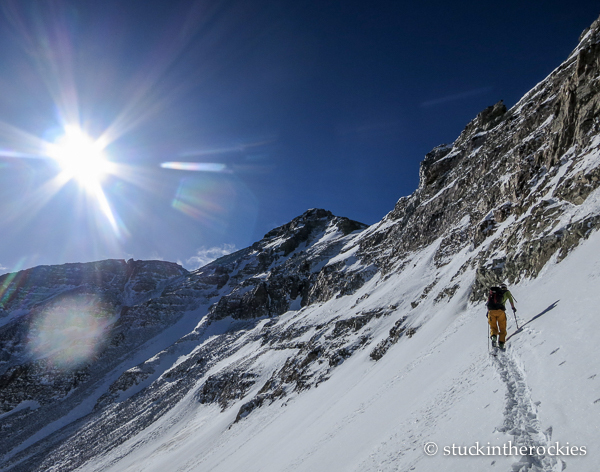 This line catches a lot of sun and the snow was actually very soft (and fun). The snow was thin, both in depth, and in this case, width. 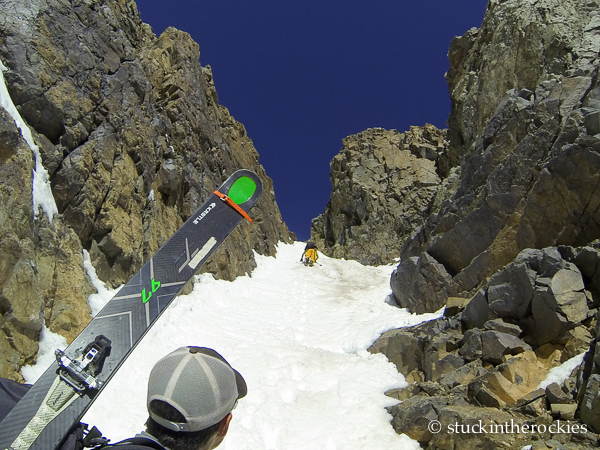 The couloir has one pinch that requires a straight line to quick check turn. And if you stay in the middle of the lower slope, you might just find the snow soft and the rocks buried. 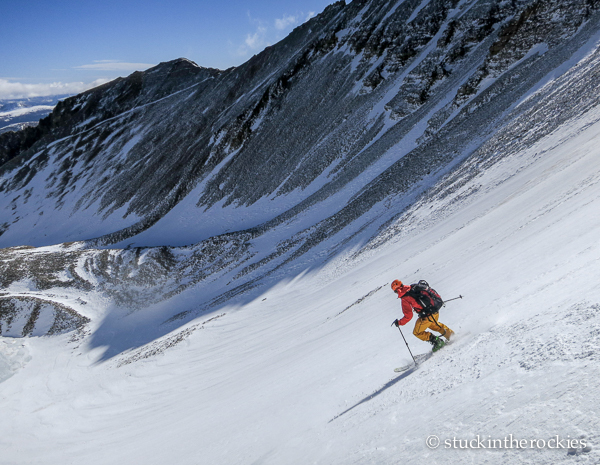 It took a little while, but I finally managed to get the trip reports from our 14er ski descents back online. Looks like a great day, Ted! 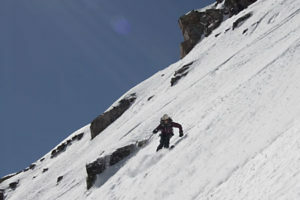 It is so fun to get up there early early season no doubt. Hope all is well! All is well here. Little one arrive yet? Any day now. Due date is this Sunday, Oct. 12. K is doing well, though pretty over being preggo 🙂 I’ll keep you guys posted. Great to see our winter friend Joey still lives here! Yes, time to get reaquianted with the winter friends! Memories of the four of us up there a few years back…in October…. LOVE IT! Tell winter-friend-Joey hello!!!! Maybe we’ll all get up there again. Lots of time left before opening day. 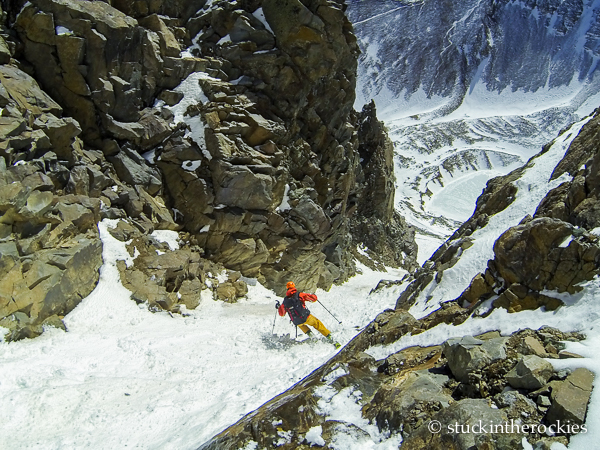 Crickey — that whole couloir looked really tight. Ill admit, it’s pretty spicy for the first day on skis after summer. Not much time for warming up! Great seeing you guys up there. That was definitely a great way to start off the season. Good seeing you too. 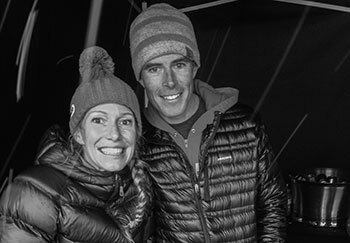 Best of luck with the remaining peaks on your list.